Quarterback Sam Ehlinger: "I will make it my mission to never let this team or this school feel this disappointment again." Ehlinger threw for 349 yards with two touchdowns and two rushing touchdowns. In two games against the Sooners this season, Ehlinger completed 66 percent of his passes for 663 yards and four touchdowns with just one interception in 71 attempts. He also ran for another 114 yards and five touchdowns. 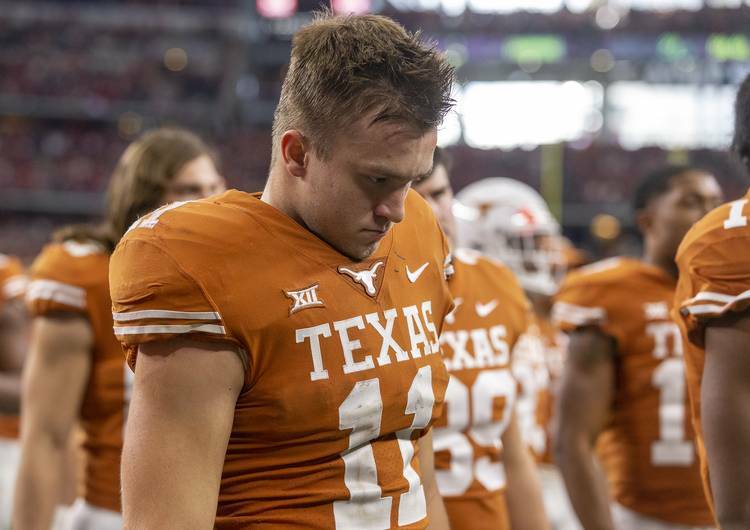 ARLINGTON — For the first time all day, Sam Ehlinger nearly lost his composure. It certainly didn’t come on the field, where he staked an unofficial claim to 2019 first-team all-conference quarterback honors with another sparkling performance against the Oklahoma Sooners. No, this came in the post-game presser where Ehlinger fielded questions alongside coach Tom Herman after a tough 39-27 loss in the Big 12 championship game. Ehlinger has come of age as a sophomore and showed some emerging leadership that will be sorely needed with the departure of some big-name senior teammates. He held his emotions in check, said all the right things, owned the fact he didn’t see OU cornerback Tre Brown on the fourth-quarter blitz that gave the Sooners a huge momentum switch, and conducted himself with the class and dignity befitting a young man in charge of quarterbacking a sleeping giant that has woken up. His most important remark should give Texas fans a happy confidence for next season. Ehlinger doesn’t like losing. “I will make it my mission to never let this team or this school feel this disappointment again,” he said. Sound familiar? Just 10 years ago, Florida’s Tim Tebow famously apologized to Gator Nation after his team dropped a 31-30 loss to Ole Miss, a game whose outcome was decided when the reigning Heisman Trophy winner was stuffed on a fourth-and-1 run play with 41 seconds to go. The Gators won their next 10 games, including an SEC championship and a second consecutive national title. It remains to be seen what happens with the 2019 Horns, but this offense is in good hands. Ehlinger gets my vote for most improved quarterback in the country, critics of Big 12 defenses be damned. In two games against the Sooners, he completed 66 percent of his passes for 663 yards and four touchdowns with just one interception in 71 attempts. He also ran for another 114 yards and five touchdowns. Now did the Horns sputter at times offensively? Sure they did. When you score only 13 points in the final 41-plus minutes against what long-time Oklahoman columnist Berry Tramel told me is the worst defense in program history, it gives you the feeling Texas let one get away. And Tramel would know; he’s been covering Sooners football for nearly 40 years. Add the 13 penalties for 128 yards and it’s easy to understand why Ehlinger wore the look of a fighter who needed just one more run to reverse a split decision. The Sooners didn’t land a knockout, but it was a convincing win. While Murray will move on to a professional baseball career after the season, Ehlinger has taken a massive step forward in piloting this group to even bigger stages moving forward. And he’s on a mission.